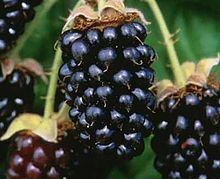 The Marionberry is a bright, glossy blackberry with medium to large fruit, somewhat longer than wide. It is special to the area because it is named after the county in which it was developed, and 90% of the world’s Marionberries are grown near Salem. The Marionberry is a trailing vigorous grower, generally producing only a few long canes which grow up to 20 feet. The Marionberry can produce up to six tons of fruit per acre. The quality of the Marionberry is high, with flavor superior to the Boysenberry or Evergreen blackberries. There are only a handful of areas in the world where caneberries thrive and Oregon’s Willamette Valley, known as the Caneberry Capitol of the World, offers the most favorable of all climates. The Valley’s moist spring rains, and summers that are warm in the daytime and cool at night, provide just the right conditions to produce berries that are sweet and plump. The berry’s taste is distinctively sweet, yet has a mildly tart and lasting flavor. Marionberries ripen through spring and early summer, reaching their peak during July (in Oregon). In Sunnyvale California their peak is in June. They are usually hand-picked early in the day. Nearly 900 Oregon growers work with about 20 Oregon processors to ensure that the delicate berries are packed fresh within hours of harvest. Oregon’s 1995 Marionberry crop was more than 12,300 tons. Health-minded consumers find them a nutritional bargain. Just 65-80 calories per cup, they are high in vitamins and fiber, yet low in sodium and fat. Summer’s fresh flavor is locked in this hybrid blackberry developed by Oregon State University’s Agricultural Research and Development Program in Corvallis, Oregon. It is a blackberry cross between two previous Oregon hybrids, the smaller, but tasty Chehalem and the larger, higher-producing Ollalie. George F. Waldo of the U.S. Department of Agriculture began its development in 1945, and it was tested at Willamette Valley farms. The new variety was released under its name of Marionberry in 1956. Native Americans all over North America have gathered blackberries. Early American settlers held blackberries in highest esteem, enjoying them fresh with cream or wine, in syrups, jams, pies, cobblers, grunts, slumps, pandowdies, wine cordials, teas, fruit waters, and flummeries. When you have had your fill of fresh Marionberries, try a pie.